Bel Suono (in a translation from Italian – «a beautiful sound») consists of three professional virtuosic young pianists who graduated from the best musical HIGHER EDUCATION INSTITUTIONS of Russia, winners of the All-Russia and international contests. Trio of musicians, in addition to masterly ownership of a grand piano, possess fine skills of composition and improvisation and charismatic appearance. Bel Suono is a new word in the music world! The purpose of new instrumental show is creation of an original mix of modern technologies with the best forms of the classical and modern musical culture, new interpretation of well familiar music pieces and execution of the original music pieces written especially for the project. 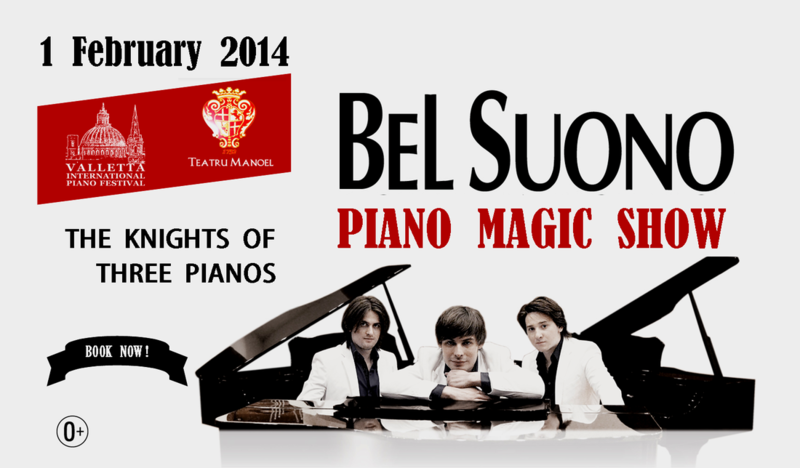 Combination of impudent youth, nobility of grand pianos sounding, modern arrangements and incredibly sensual light on a stage – is all about Piano Magic Show - Bel Suono! Bel Suono is implementation of a highly artistic quality product and of modern external component. Three young, artistic, virtuosic and rather hansome pianists perform absolutely different music - from very popular to absolutely new. You will hear such world hits of classical music, as “Libertango”, “Ravel's Bolero”, summer from Vivaldi's series "Seasons", as well as extraordinary by its insight and sound of new pieces written by project participants. Classical pieces of music sound very modern and consequently the listeners not familiar with them - will await real opening in the world of classical music! While judges of classics will hear unusual interpretation of favorite pieces of music! Let's hope that it won't disappoint them. Especially should be noted very successful experiment of “Bel Suono” in the field of dancing music. The track “Te Quiero” created by the third participant of a piano trio by Alexander Motovilov and Dj Magic Finger. This composition exists in three versions – instrumental, vocal and remix, created by known German Dj – Jasper Forks. All options make tremendous success on radio and promise to be an opening track of dancing season this summer, which will blow up dancing grounds of Russia, Europe and Asia! Currently work on video “Te Quiero” is coming to the end, which is very awaited by all musical channels! The piano show Bel Suono managed to take part in such meaningful events as, movie awards «Gold Eagle» on the channel Russia 1, the award "Vocation" on 1 channel, participation in concerts at the City Crocus Hall in Moscow and in Big Concert Hall «October" in St. Petersburg and other prestigiouse events. The Bel Suono is already enough known in the West and in Asia, thanks to the British music channel C, which is rotating the first four videos. They are also touring a lot in many cityes of Russia and abroad. The Magic Piano Show is the First ever time in Malta. This is a unique event - not to be missed !